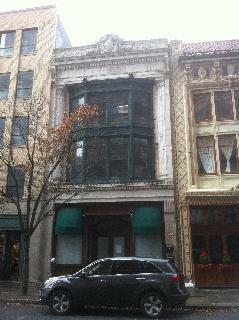 This building still bears the name of the Loew’s Poli Cinema which entertained visitors on this site from 1917 to 1960. As rich in history as the city itself, the structure was designed by Thomas W. Lamb for Sylvester Poli, a theater developer during New Haven’s shipping boom. Two spacious, full-floor two-bedroom apartments occupying the upper floors. Tenants are responsible for their own utilities. Each unit features dramatic bay windows facing the old Taft Hotel, also allowing views towards the New Haven Green. With exposed brick walls in the generous open kitchen / living room, the units provide a NYC loft experience in the heart of downtown New Haven. Each unit features two bathrooms, a dishwasher, and a washer/dryer. The building is a short walk from the center of the Yale College campus, as well as the Medical School and the Art & Architecture Building.